Brooks B17 Standard Bicycle Saddle and incidental Brooks Proofide Leather Dressing — I recently replaced my old Bontrager saddle and am loving the difference. Just do make sure your saddle is adjusted and angled correctly. The late and irreplaceable Sheldon Brown has a ridiculously detailed writeup on comfortable saddles which is worth a read and talks about proper adjustment for both male and female anatomy (There’s a women’s variant of the B17 as well). ✍ Bob: I really like the version of the B17 that comes in various colors. I saw these in a bike shop last week; they’re beautiful. Briefs 2 — I’ve been using it in relation to a CocoaConf talk on prototyping I’ve given recently and I’m continually surprised by how much you can do with it. Stay tuned for its upcoming release! 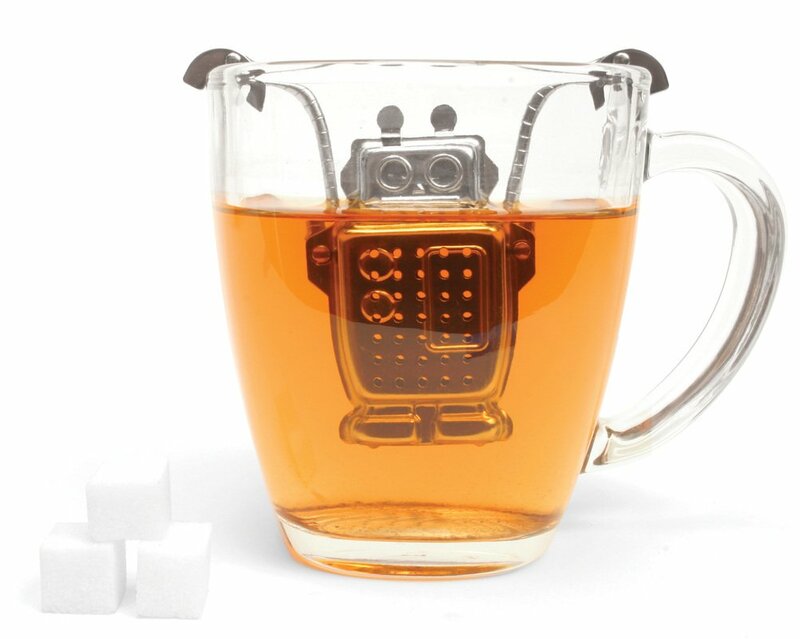 Kikkerland Robot Tea Infuser — Spaceships and monkeys also available as needed. Belkin Rockstar Multi Headphone Splitter — Invaluable if you want to watch Strawberry Shortcake on a flight from Ohio to San Francisco with your two little girls. Victorinox Channel Knife — I really like single purpose tools. This channel knife is only a channel knife — no zester or other doo-dads attached. If you’ve always had a hard time making twists, do yourself a favor and get this knife. I can’t express how very disappointed I was when I left it in New Jersey. Story time: Because “You know about computers,” I’ve been fixing some weirdness on my friend’s Mac. (Pro tip: If you replace your hard drive and for some unknown reason have two different Time Machine backups, don’t restore from the two-year-old backup instead of your current backup.) When my friend dropped off the computer, he didn’t bring the keyboard, and the bluetooth pairing dialog in 10.8 is obscured by the Wi-Fi connection dialog, so my fancy bluetooth keyboard was useless. Which brings me to my like: the Griffin iMate ADB-to-USB Adaptor — available on Amazon and a bit cheaper on eBay. I connected my Apple Extended Keyboard II and it just worked. Etymotic Research ETY-Plugs earplugs — These earplugs let you listen to loud music without making it sound muffled. Insanely great. ✍ Ben: I agree heartily. Possibly the best $10 I’ve ever spent on Amazon. Thanks to Dave Dribin for the original recommendation on these. Day One — I’ve been using Day One for Mac and iOS off and on for a couple of years, and I’ve finally gotten the hang of it. I don’t use it for journaling so much as for taking notes of anything I want to remember. It’s as good as Drafts for making it really easy to make a new note, but unlike Drafts, I don’t have to send that note anywhere. It’s just all there. Sort of like an infinitely big, chronologically arranged Field Notes that syncs to my Mac. Over iCloud, no less! And the app’s sound effects are so good I’ve pulled them out and use them as text and voicemail tones. Facebook Chat Heads — A great addition to Facebook on iOS. Drag your friends heads around like you’ve always wanted to! BEN: I happen to strongly dislike these things. I don’t even really know what I want to call them. Facebook calls them ‘Chat Heads’ which seems to read poorly and Wired argues that they will be called ‘chatheads’ by the internet regardless of what Facebook wants. BOB: That’s a dumb article, first because quoting your own copy editor is lazy, and second because grammar scolding is generally obnoxious and in this case absolutely wrong. Chat heads are great. I like to move them around. ✍ Note the disagreement; this is how you know we’re actually two people and not just unctuous Google spider-recommenders. BEN: How is it wrong? Enlighten me. I’m not a level 45 grammar wizard like you. Also, it wouldn’t be the first dumb article out of Wired. BOB: Here’s an article by Grammar Girl about using nouns as adjectives. We do it all the time. Generally, correcting other people’s grammar is almost always pedantic, but in this case, when a company is actively coining a new term, it seems polite to let them coin it as they wish. “Think Different” is probably a more egregious example of bad grammar (in that it’s an example at all), but I’m happy with that slogan. BEN: Right. Does the press let Apple get away with grammatical foibles? No way. Do they let Microsoft? Nope. Also, Facebook does have a bit of a double standard since their own name is the counterexample. BOB: Let’s not let our standards be defined by the most ill-mannered among us. I guess you’re right, though — I’m happy to let the i in iPhone remain uncapitalized, but Yahoo’s execrable exclamation point seems ridiculous. I’d generally like to call things what their creators name them, except where good taste and common sense dictate otherwise; if Wired doesn’t like “chat heads,” sure, they can go ahead and call them what they want — but there’s no grammatical issue at stake. That’s a specious argument. BEN: I think that’s a fair assessment. I still don’t like how they’re always occluding some piece of the interface. It’s also an element of the app I incessantly feel like I have to manage (which, if you convert “manage” to “play with”, was probably a design feature). BOB: I’d probably hate chat heads if Facebook had a more austere interface, but it’s already so busy that I don’t mind a bit more busy-ness — particularly since this is the one place in Facebook where I really want a notification, where people are actually talking to me. I’d be more worried about confusion and clutter if Facebook weren’t just for dicking around. N.b. : Amazon links above are affiliate links because we’re hopelessly corrupted by even the simplest, smallest kickback schemes.